Is the GOP the Real Party of Women? In this election year, there’s no doubt that women are a hot property—like the Boardwalk in Monopoly hot. Both the Democrats and Republicans are falling all over themselves to claim the title “party of women,” while accusing the other of being a charlatan. Politico hosted the latest rejoinder yesterday, when a group of 14 House GOP women (including Michele Bachmann) wrote an op-ed arguing that their “big tent” is where all the ladies want to be. But of course, neither party is truly the “party of women.” Or better put, each party serves the interests of different types of women. So while the piece fails to convince in universal terms, it does present a fascinating profile of exactly who the Republicans think they’re representing. There’s an old joke about a married couple that’s asked about their hobbies and interests. The husband says he’s focused on “important things”—like the federal budget, health care reform and peace in the Middle East. The wife says she’s focused on the “small things”—like their household budget, their children’s health care and keeping peace within their family. There’s an important truth here. The things that women focus on and the decisions they make are often unappreciated—but they’re the foundation of our society. Huh. So controlling their husband and/or children’s intractable spending and bellicose interactions is so preoccupying that women can’t be bothered to think about “important things” like the Middle East? Does that strike anyone else as being almost comically retrograde? Darling, you know I just get lost when you boys start talking business; let me refresh your drink. It’s absurd, and moreover, the rest of the piece, which details all the “important” issues on which the GOP supposedly trumps the Democrats, is even more unhinged since the straw women in question should be too distracted by making sandwiches or whatever to care. If I were a real Republican woman, I’d find all this very condescending … but I digress. Beyond this initial fumble, the op-ed traffics in the traditional conservative rhetoric of by-your-own-bootstraps capitalism. “We want an equal chance to succeed—no special favors and no glass ceilings,” the congresswomen write. 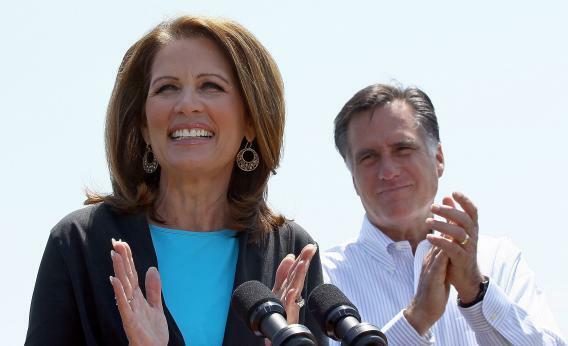 Obviously we’re all against glass ceilings, but what do Bachmann and company mean by “special favors”? Based on their bashing of our new friend “Julia,” it’s any government program that’s designed to help make up for the structural inequality in our society that still places many women at a large disadvantage, especially economically. It takes little critical thinking to realize that “social issues” like reproductive health are fundamentally tied to economic success and that the popular conservative idea of achieving wealth or middle class stability or what-have-you by one’s “own initiative” is inextricably wrapped up in class, gender, and dare I say it, racial privilege. And in the final analysis, privilege (not a favorite word of mine due to its overuse, but unavoidable here) is the perennial Republican blind spot. No one wants to depend on the government for much of anything; we lack the European gene for that. But many women—due to the quicksand of historical injustice, unequal education, institutional sexism, a lack of inherited money or financial literacy and a hundred other factors—need the government at least to extend a branch to help pull them forward. Unlike the hypothetical “Republican woman,” these ladies do not have the luxury to be unaware of the “important things”; but then again, it’s clear they’re not really invited to the party of women anyway.